U.S. HOUSE COMMITTEE ON TRANSPORTATION AND INFRASTRUCTURE: Hunter Statement from Hearing on "Examination of Reports on the EL FARO Marine Casualty and Coast Guard’s Electronic Health Records"
U.S. House Committee on Transportation and Infrastructure issued the following announcement on Jan. 30. 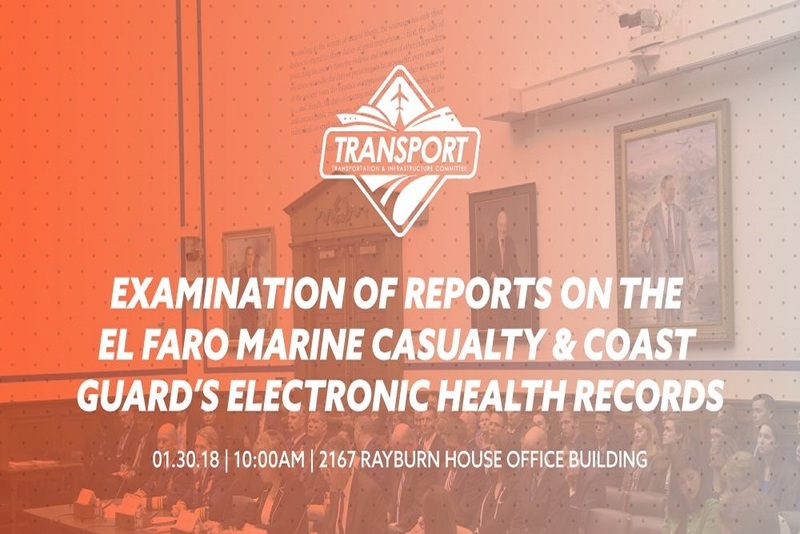 The Subcommittee is convening today to examine the fatal sinking of the U.S.-flagged cargo ship SS EL FARO and, on a second panel, the Coast Guard’s failed efforts to implement an Electronic Health Record system. On October 1, 2015, the 790-foot U.S.-flagged cargo ship SS EL FARO sank in the Atlantic Ocean about 40 nautical miles northeast of Acklins and Crooked Island, Bahamas. An unusual storm path, reliance on outdated weather reports, and failure to implement proper bridge resource management techniques resulted in EL FARO sailing almost directly into Hurricane Joaquin, a Category 4 storm with an estimated sustained wind speed of 115 knots. The loss of the U.S.-flagged cargo vessel EL FARO, along with its 33-member crew, ranks as one of the worst maritime disasters in U.S. history, and resulted in the highest death toll from a U.S. commercial vessel sinking in almost 40 years. The last comparable U.S. maritime disaster was the sinking of the U.S. bulk carrier MARINE ELECTRIC off the coast of Virginia in February 1983, in which all but three of the 34 persons aboard lost their lives. The Coast Guard instituted major changes following that tragedy to improve safety and prevent similar events from occurring in the future. Despite those efforts to improve safety, tragedy befell the EL FARO. On October 31, 2015, a U.S. Navy vessel located the main wreckage of EL FARO and the vessel’s voyage data recorder was successfully recovered. It contained 26 hours of bridge audio recordings and other critical navigation data that were used by Coast Guard and the National Transportation Safety Board (NTSB) investigators to understand the causes of this horrible incident and develop recommendations to prevent future tragedies. The Coast Guard Marine Board of Investigation made 31 safety and 4 administrative recommendations to address the causes of the EL FARO sinking. In December 2017, the Commandant of the Coast Guard released his Final Action Memo on the Marine Board’s recommendation. The Commandant concurred with 29 of 31 safety recommendations and 3 of 4 administrative recommendations. The NTSB launched an investigation as soon as the sinking of EL FARO was confirmed, ultimately providing numerous recommendations for responsible entities, including the Coast Guard, the International Association of Classification Societies, and the owner of the EL FARO. The nation relies on our merchant mariners and the U.S.-flagged ships they sail; it is critical that policies are in place and adopted as standard practice to ensure mariners’ safety. In order to do so, we must learn from the loss of the EL FARO. I look forward to discussing how this tragedy occurred and what steps are being taken to prevent another such incident from occurring. Notwithstanding the importance and gravity of the EL FARO tragedy, on panel two we will examine the Coast Guard’s apparent inability to implement an electronic health record system to manage data for its over 56,000 Coast Guard members and retirees. After wasting more than $66 million over a five-year period, the Coast Guard cancelled its electronic health records effort, referred to as the Integrated Health Information System project. The Service has nothing to show for the time and money expended and finds itself in a worse position than before it awarded the first contract in 2010. Today, the Coast Guard is still handling all medical information using paper records – records that cannot be shared with Department of Defense or Department of Veterans Affairs systems. Following a Subcommittee request to review Coast Guard actions, the Government Accountability Office (GAO) found that for nearly the entire span of the project, the Coast Guard allowed program managers to act without sufficient oversight by acquisition professionals. Even when the Coast Guard established its Non-Major Acquisition Process policies to provide oversight for information technology acquisitions – things like the Integrated Health Information System project – they did not implement any oversight. Despite chartering several oversight bodies for the project, GAO found that the Coast Guard “could not provide evidence that the boards had ever been active in overseeing the project prior to its cancellation.” Other than realizing they had been throwing away good money for years, the Coast Guard still cannot provide a solid explanation as to why it cancelled the Integrated Health Information System project. The Coast Guard needs to show what it’s learned and how things have changed, as it works to finally implement an electronic health record system. We understand the Service is following its acquisition policies for the current effort, and has conducted significant research which pointed to a recommended solution of using an existing federal agency system. After a five-year epic failure, these are positive steps. However, we need to hear more about the policies and procedures that are now in place to prevent the waste of taxpayer money in the future. I look forward to discussing how this debacle occurred, what steps the Coast Guard is taking to ensure nothing like this can happen again, and where they are in the process of finally acquiring an electronic health record system. I thank our witnesses for being here today and I look forward to hearing their thoughts on these very serious issues. Want to get notified whenever we write about U.S. House Committee on Transportation and Infrastructure ? Next time we write about U.S. House Committee on Transportation and Infrastructure, we'll email you a link to the story. You may edit your settings or unsubscribe at any time.